Fans that have already finished Cassandra Clare’s Lady Midnight are in for a major treat! Since there are a lot of characters in Cassie’s new book, shippers can go wild but I’m sure that most of us can agree that one ship is very special and gives us ‘all the feels’. Cassie has previously shared unedited scenes that didn’t end up in her books, like the cave scene from City of Heavenly Fire, and yesterday she took to her tumblr to share a scene from Lady Midnight that features this pairing so drop everything – unless you’re holding a child or an animal – and read it below. MAJOR SPOILER FOR LADY MIDNIGHT! PLEASE DO NOT GO ON READING IF YOU HAVEN’T READ/FINISHED THE BOOK YET! As promised, Cassandra Jean’s Emma and Jules from Lady Midnight. Emma rolled onto her back and stared up at Julian and the sky behind him. She could see a million stars. He was shivering, his black shirt and jeans plastered to his body, his face whiter than the moon. She had never heard him say anything like this, never heard him talk this way, never seen him so close to losing control. “I didn’t mean to hurt you,” she said. She started to sit up, reaching for him. He caught her wrist. His face twisted. The wall that usually hid the truth deep in his eyes had crumbled; she could see the hungry panic there, the desperation, the relief that had punched through his defenses. He was still holding her wrist. She didn’t know if she leaned into him first or if he pulled her toward him. Maybe both. They crashed together, hard, like stars colliding, and then he was kissing her. Jules. Kissing her. The shock was all she felt at first, his cold mouth against hers, and then she tasted him, under the salt water, the hot-cool taste of sugar and cloves, and it was as if someone had flipped a switch inside her body and turned on all the lights. “Emma,” he murmured against her lips, not taking his mouth away from hers. They were clasped together, wet and cold and hot and burning all at once. He leaned into her, kissing her harder, feverishly, his hands burying themselves in the thickness of her wet hair. The weight of him bore her down onto the sand. She clutched at his shoulders, thought of the disoriented moment when he’d pulled her out of the water, the moment she hadn’t quite known who he was. He was stronger, bigger than she remembered, than she had let herself know, though every kiss was burning away her memories of the boy he had been. It was like nothing else that had ever happened to her. Her lips parted and her head fell back. Julian slid one hand under her head, his fingers splayed across the back of her skull, cradling her even as his tongue stroked inside her mouth like a bow across a violin, wringing painful sparks from her nerves. So this was what it was supposed to be like, what kissing was supposed to be like, what all of it was supposed to be like. This. Her whole body was shaking. She clutched at him, at his shoulders, his sides, her fingers digging into his skin, dragging him harder against him. He gasped into her mouth when she reached down to grab the hem of his soaking wet shirt and tore it up over his head. His eyes were catlike, burning in the darkness, hot with hunger. “Emma, God —“ he said in a choked voice, and then he was gathering her up under him again, pressing her against his body as if he could press them into each other, meld them into one person. His hands clawed at the back of her shirt, and she pulled back far enough to let him help her shimmy out of it. And then they were kissing again, more fiercely now that they could feel each other’s bare skin. She couldn’t stop touching him, her hands roaming down his back and over his waist, feeling the dips and divots of muscle, the bumps of his spine. And he was touching her, too. She looked down in disbelief that this was actually happening, that this was Julian touching her, her Julian. His long fingers stroking up the curves of her waist, caressing her back, fumbling against the clasp of her bra until finally it snapped open and slid off her shoulders. She shrugged it to the ground. It fell to the wet sand and they stared at each other. His pupils widened, darkening his eyes to the color of the ocean at night. His eyes seemed to devour her, and she in turn was staring at him: he was gorgeous in the moonlight, spare and clean and muscular, and when had that happened? She opened her arms and he went into them. Her breasts flattened out against his chest as he held her to him, his hands stroking over and over down her back. Slowly, he lowered her to the sand — he reached out and grabbed her shirt, not taking his mouth away from hers, and he pushed it under her, pillowing her head. She made a soft sound — something about the tenderness of the gesture, a bright sweet flare of gentleness cutting through the fierce dizziness of their shared hunger, made her want to cry. “Jules,” she whispered. Somehow she kicked her wet jeans off without letting him go, and the sand scratched lightly at her bare calves. She parted her knees, making her body a cradle for him to lie against. He kissed his way down her throat, his breath warm on her skin. Tangling her hands in his wet curls, she stared up in wonder at the sky above them, wheeling with stars, shimmering and cold, and thought that this couldn’t be happening, people didn’t get things they wanted like this. He reached down to unsnap his own jeans and she helped him as much as she could. Sand scraped against her elbows when she moved. With anyone else she would have been bothered by it, but there was no room in her head for anything but Julian. She stared at him: he was propped up on one arm, his wet hair pasted to his forehead in dark curlicues. Moonlight sparked off his eyelashes, each one as long and dark as the fillip of a pen stroke. Pale white scars starred his bare shoulders. He was more beautiful than the whole of the sky. He kicked the jeans off and surged back up her body, sliding his hands underneath her to cup her shoulder blades. He kissed her collarbones, the space between her breasts. She arched her hips up. He was hard against her thigh and when their bodies ground together he made a choked sound, a moan, as if something inside him had broken. “Do you want to stop?” She froze. His eyelashes trembled against his cheek. “I can’t not,” he said, low, heartfelt, “I can’t,” and his mouth found hers, trembling, inexpert. She kissed the breath out of him, out of both of them, until he was moving against her, restless and uncontrolled. The last of their clothes were discarded. His skin was as hot against hers as if he had a fever. She heard him whisper her name. There were only molecules of air between them, and then Emma moved to wrap her legs around his waist. Julian gasped and his body moved instinctively and then there was nothing between them at all because he was inside her. They froze, looking at each other, motionless. Julian’s teeth were dug into his lower lip. His face was flushed, his eyes brilliant. He looked shocked and amazed and overwhelmed and desperate. “Emma, God, Emma, I —” he choked, and then his words dissolved into inarticulate sounds as his body moved against hers. Emma held onto his shoulders, tightly, and her body was moving, too, she couldn’t stop it, but she was also staring, and she’d never done this with her eyes open before, she’d always closed them, but this was different, this was Julian. Not Jules, not her sweet boy Jules, this was someone else, someone who made harsh sounds of rapture and buried his face in her hair and gripped her body hard enough to leave marks. She hoped he did leave marks, bruises even. She hoped they’d last for days. Because she was trying to memorize him, trying to memorize the way he looked above her, silhouetted by stars, hair in his face and eyes half shut, the lines of worry that were always next to his mouth smoothed away by pleasure, but she couldn’t. She couldn’t hold it in her mind. Her concentration was fragmenting, she couldn’t grasp onto it, thoughts flying from her head like the spray of the ocean dissolving in the air. Lightning forked up and down her veins and she was clawing at Jules’ back, gasping, trying to get enough air, trying to pull him closer and closer still and then the world burst apart in bright fragments, a broken kaleidoscope, and she finally, finally, closed her eyes and let colors she had never seen before paint the insides of her eyelids. As if at a distance she heard Julian cry out, felt him collapse against her, kiss her shoulder, nuzzle his way into her neck. His heart was still racing, slamming against hers. She loved him so much it felt like her chest was cracking open. She wanted to tell him so, but the words stuck in her throat.“You’re heavy,” she whispered instead, into his hair. He laughed and rolled to the side, pulled her hard against him. She relaxed into the warm curve of his body. He reached down, grabbed his dry flannel jacket, spread it over them. It wasn’t much, but Emma huddled under it, giggling, and he kissed her face, almost drunkenly peppering kisses across her cheeks, the bridge of her nose, her chin. She laid her head down against his arm. She had never felt so happy. He had stopped kissing her face and was gazing at her, head propped up on one hand. He looked dazed, his blue-green eyes half-lidded. His fingers traced slow circles on her bare shoulder. 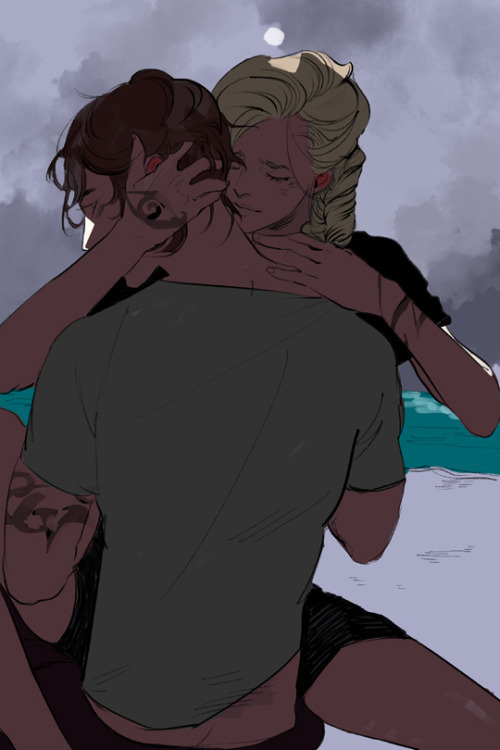 She thought, I love you, Julian Blackthorn. I love you more than starlight. By the angel Cassie!! Why do you do this to us poor, poor shippers?? I haven’t had the chance to read the book yet because I still need to read the Shadowhunter Academy books- I’m OCD like that in I need to do everything in order. Lol. But I couldn’t stop myself from reading this! Oh I hope hope hope that this ship continues so sail in the next three books. Clary and the others have already done so much to bring The Clave into the 21st century, let’s hope they can make parabatai being together like this acceptable too. This isn’t Jem’s generation anymore, but maybe he can remind them all of what happened when you try to separate not only parabatai but ones that are in love with each other too. I was remembering the couple in Infernal Devices as I read this. Two books not three! Lol. Trilogy not series! Oops! Although I still hope that there will be a way for them to be together. By the angel! I hope that they will stay together, even though the reason the law forbids it!! !😢😢😪😪😞😞😞😞 Please, Cassie, Please!!!!! By the Angel MYYYY FEEELELLLSSSS im in love, personally im saying this from the bottom of my heart PLZ PLZ KEEP THEM TOGETHER CASSIE!! Even though the Law forbids Parabatai to fall in love, who CARES!